Ski alpinists know that they earn their descents with aggressive, technical ascents. The Procline Hybrid Hoody delivers thermal performance with climate control for the climb. Two fabrics combine using Arc’teryx Hybrid Mapping technology. A Tyono™ nylon shell is bonded to a light, moisture wicking microgrid Polartec® fleece. The Tyono™ shell is a 20 denier nylon that is light, compressible and deceptively durable. It has a DWR treatment to shed light moisture, and blocks wind while still providing enough air permeability to prevent overheating. The Polartec® Classic 100 micro velour small grid fleece lines the body and top of the hood to provide efficient, lightweight warmth and moisture transport. Under the arms and down the sides, where heat release and freedom of movement are critical, Polartec® Power Stretch® fleece with Hardface® Technology is used. Lightly brushed on the inside, and delivering exceptional stretch, the material’s smoother face helps with snow and abrasion resistance. Efficient fit and elevated ergonomic freedom are key to the Procline Hybrid Hoody’s design. By using Polartec® Power Stretch® fleece with Hardface® Technology under the arms, freedom of movement is improved by adding stretch and reducing bulk. 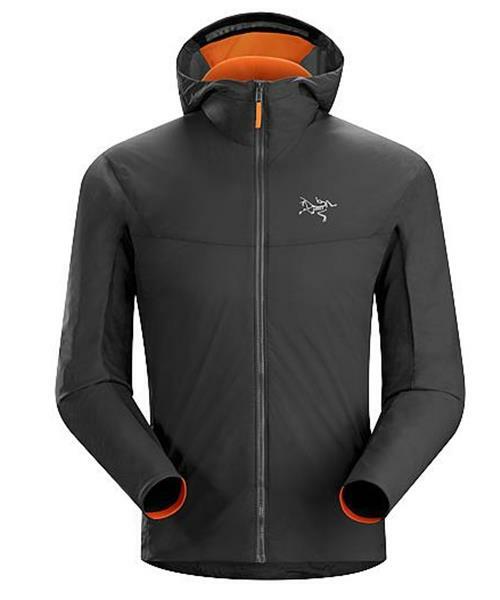 The Arc’teryx Trim fit with e3D keeps the hoody close to the body for a higher level of fabric efficiency and easy layering under a hardshell. Aggressive articulation is built in, a requirement particularly necessary on challenging ascents. Designed to weigh as little as possible while delivering the performance needed, the Procline Hybrid Hoody is intelligent and minimalist. The hood is lightly insulated and snugs securely with a single hand adjuster for a full coverage fit that works with or without a helmet. Two low profile hand pockets stow small essentials. The unique No Slip Zip™ combines the security of a locking slider with the ease of a nonlocking quick release system. Every twelfth tooth has a bump on it. This prevents the zipper from opening inadvertently, but still allows the ability to unzip with a single hand for rapid ventilation. It’s a simple feature, long in development, that makes a difference.